A white supremacist from Germany who denies the Holocaust ever took place has been expelled from Canada after a two-year legal battle. Ernst Zundel, 65, arrived in Germany on Tuesday and was immediately taken into custody by German authorities. Germany was able to seek his extradition on the grounds that he was running a web site denying the existence of the Holocaust. Zundel once described Adolf Hitler as a "decent and very peaceful man". Last week, a Federal Court judge ruled the his anti-Semitic and hatred-inciting activities were "not only a threat to Canada's national security, but also a threat to the international community of nations". It took Canadian authorities two years to establish whether Zundel, who authored a book called "The Hitler we loved and why", posed a security threat. During that time, he was being held in near-solitary confinement. Denying the Holocaust is a crime in Germany, where Zundel's theories could be easily accessed and read through the Internet. This enabled authorities there to open a case against him. 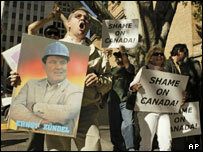 Zundel, who was born in Germany, moved to Canada in the late 1950s. In 1988 he was convicted of "knowingly publishing false news" after issuing a leaflet carrying the title "Did six million really die?". Zundel, who never managed to obtain Canadian citizenship, moved to the US in 2001 but was later deported back to Canada for allegedly violating immigration laws. A group that led a campaign to have him extradited, B'nai Brith Canada, welcomed last week's verdict. "For decades, Zundel has spewed his venom and imbued his brand of hate in a new generation of white supremacist groups that had made him a hero," the association's vice president, Frank Dimant, said in a statement. Zundel is now expected to be kept in custody while a German judge reviews his case.